Trump sat down with Rudy Giuliani, his new cybersecurity adviser, to discuss an impending executive order aimed at safeguarding the nation's critical infrastructure and the systems used by intelligence agencies from future cyber attacks. The order was originally expected to be signed later this afternoon, but it was cancelled for unknown reasons. Each cabinet official will be held accountable for the security of their agency's data. The order calls for an assessment of the cyber risk to the government's IT networks in preparation for system-wide upgrades. 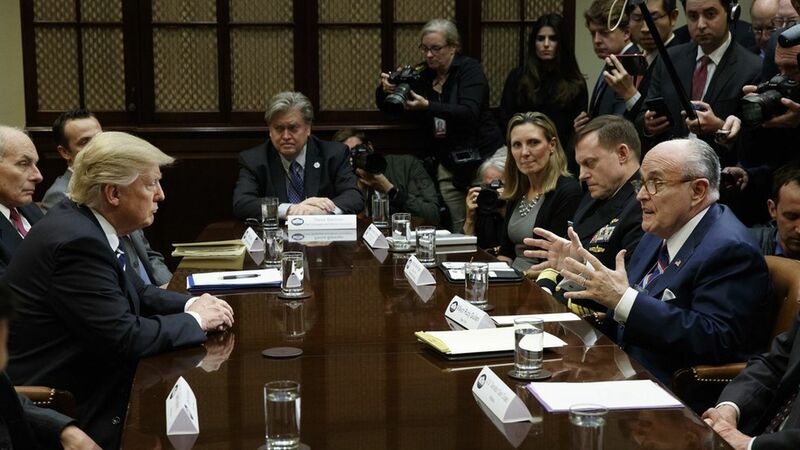 The Department of Homeland Security will be directed to develop strategies for protecting agencies' most critical information and networks and responding to future breaches. The Commerce Department, Defense Department and other agencies will be directed to work with the private sector (which Trump says is "way ahead of the government") to ensure those who oversee critical infrastructure—including power plants and electrical grids—have the appropriate resources to ward off cyber attacks. "Now I think a pretty good example of this is despite how they spent hundreds and hundreds of millions of dollars more money than we did, the Democratic National Committee was hacked successfully, very successfully, and terribly successfully. And the Republican National Committee was not hacked. Meaning it was hacked, but they failed. It was reported, I believe, by Reince and other people that it was hacked, but we had a very strong defense system against hacking." Prodding the private sector: Giuliani praised Trump for using the bully pulpit to "get the private sector to wake up…to the fact that they have to do more" to adopt effective cyber security protections.